This receiver's I.F. system is based on a W7ZOI design that utilised two MC1590G I.F. amplifiers and a hang AGC system. I used MC1350P as the I.F. amplifiers in my version. The receiver has an I.F. frequency of 5 MHz. I was given the filter and the BFO crystal years ago. The front end was originally built using a 3 stage band pass filter in front of an SA612AN mixer which seemed to perform very well however I replaced it with a passive double balanced mixer as there is adequate I.F. stage gain. The receiver is actually more sensitive with the passive mixer arrangement. The product detector is an SA612AN followed by an LM386 audio stage. The VFO is an AD9850 DDS board controlled by an Arduino Nano. I found a circuit on the web to drive the LED S-meter display. The front panel has on/off/volume control beside the S-meter, VFO control to the right of the LCD display and I.F. gain below. The two toggle switches are for muting and AGC on/off. The case was purchased from Jaycar Electronics and an aluminium front panel, rear panel, chassis and dividers were fabricated in the workshop. The last two photos are the two RF front-end versions. The one on the right is the original SA612AN with a 3 stage filter. The one I settled on has the passive mixer. The 'hang' AGC is a pleasure to listen to, with a short period of silence after a strong incoming signal disappears and I.F. gain is restored to maximum gradually. 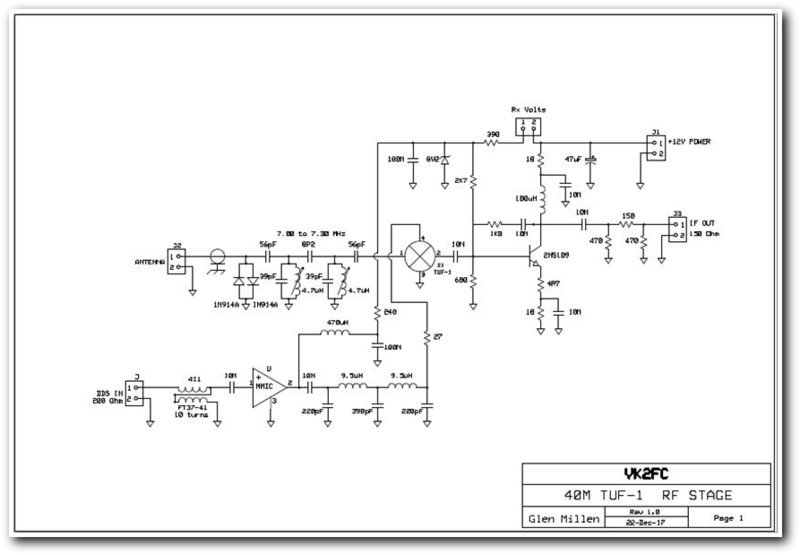 Below is the front end circuit I settled on for use in this receiver. Click on the image for a link to the PDF version.